Citation Information: J Clin Invest. 2017;127(5):1960-1977. https://doi.org/10.1172/JCI91138. Three injections of anti-CD4 prevent both acute and chronic GVHD and preserve GVL effects after HCT with C57BL/6 donors and BALB/c recipients. 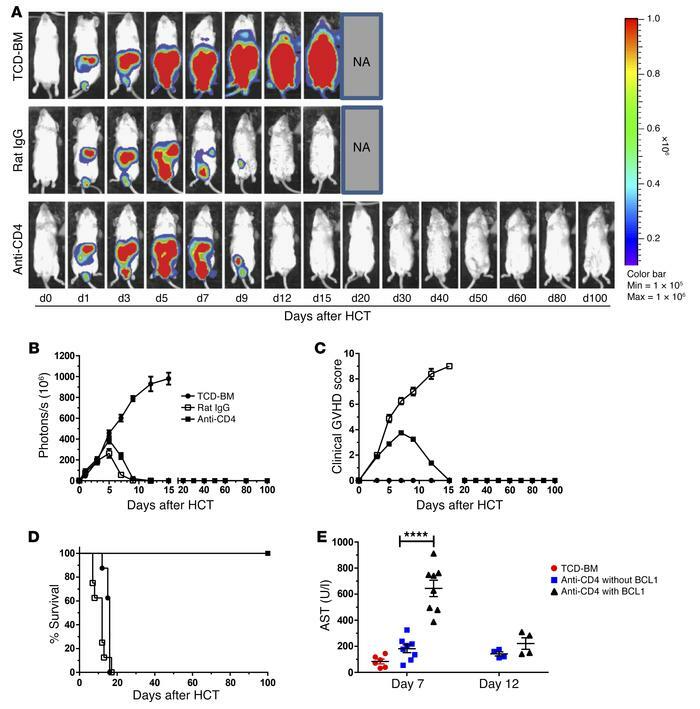 Lethally irradiated BALB/c recipients transplanted with splenocytes (5 × 106) and TCD-BM (2.5 × 106) from C57BL/6 donors. Recipients were challenged with i.p. injection of BCL1/Luc cells (5 × 106 per mouse) and were given 3 i.v. injections of rat IgG or anti-CD4 mAb (500 μg/mouse) at days 0, 14, and 28 after HCT. Recipients given TCD-BM cells (2.5 × 106) alone were used as controls. Mice were monitored for tumor growth using in vivo bioluminescent imaging (BLI), clinical signs of GVHD, and survival. (A) One representative BLI image from each time point is shown for each group. (B) Summary of photons per second of recipients. (C) Clinical GVHD score. (D) Percentage of survival. (E) Serum AST concentrations on days 7 and 12 after HCT. n = 4–8 per group, combined from 2 replicate experiments. Data represent mean ± SEM. P values were calculated by multiple t test (B and C), log-rank test (D), or unpaired 2-tailed Student’s t tests (E) (****P < 0.0001).